Flammable materials are classified as substances that have the ability to ignite and burn slowly or rapidly. Many common workplace and household materials are considered flammable; including propane, methane, gasoline, acetone, alcohols, toluene, paints, adhesives and many more. In this article, US Chemical Storage illustrates important flammable classifications, safe storage of flammable liquids and workplace procedures for handling, transferring, and storing these dangerous materials. Flammables and combustibles must be stored properly for full compliance. Flammable and combustible chemicals can become unstable and react, therefore keeping storage temperatures maintained is necessary. Climate controlled storage buildings are designed to keep storage environments at specific temperature intervals, depending on the specific chemical being stored. To ensure safe storage of your flammable chemicals, obtain a Material Safety Data Sheet (MSDS) for each chemical to identify potential hazards including health, flammability and reactivity. Do not store flammable materials near doorways or exits. Hazardous inventory should always be stored away from electrical equipment and ignition sources including direct sunlight and/or heat. 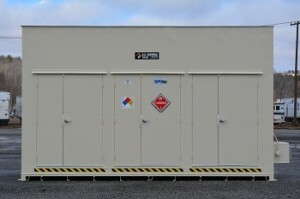 Safe storage of flammable liquids prevents hazards associated with flammable chemicals. When transferring flammable liquids ensure the transfer container is approved, and designed for the properties of the liquid being transferred. Before transferring liquids from containers, ensure that each containers is grounded with grounding wires to eliminate any electrostatic discharge. After making grounding connections, touch the ground to discharge yourself prior to handling containers. Prior to storing flammables, implement necessary safety accessories to your flammable storage building. Safety accessories include mechanical ventilation, temperature controls, fires suppression systems, temperature sensors, gas detectors and other explosion proof and non-explosion proof accessories. In order to address and decrease possible risks associated with the storage of flammable materials, workplace procedures should be developed for handling, transporting, and storing hazmat. Workplace procedures should address fire prevention, spill clean up, proper dispensing methods, incompatible material storage and personal safety equipment. Personal safety equipment should be worn at all times while handling, transferring or storing flammable or combustible materials. Contact US Chemical Storage online or call 888-294-2729 to learn how a flammable storage building can provide increased safety to your daily operations.